Repurpose your box grater – Freeze a stick of butter and grate them directly into the flour for make pie crusts and pastries. Salad greens tend to transpire when kept in the refrigerator and the buildup of that moisture causes them to become soggy. Store your greens in a plastic bag with a dry paper towel to absorb that moisture and allow the greens to stay crisp longer. Pit Cherries by placing them over an empty glass bottle and push each pit through with a chopstick. Use cooking spray to coat measuring cups to measure sticky stuff like corn syrup, molasses and honey. To preserve fresh herbs, chop them and place in ace cube trays. Fill each compartment with extra virgin olive oil and freeze. For summer punches and Sangria or other cold drinks where traditional size ice cubes are too small, make ice cubes in muffin tins. 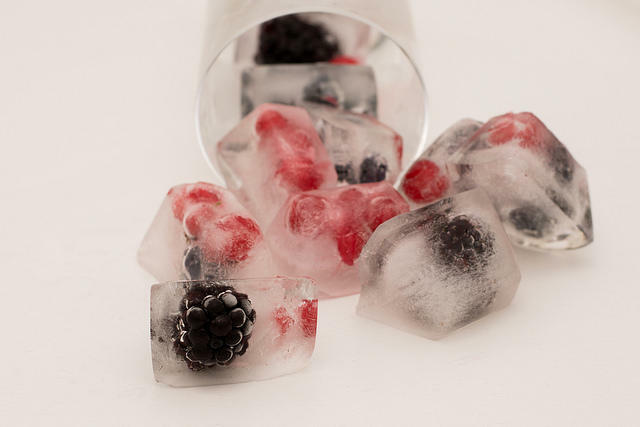 Feel free to add fruit or other garnished to the trays to make decorative and functional ice cubes. Use a heating pad set on low for helping yeast doughs to rise. Gluten Free – use crushed Rice Chex as Panko Bread Crumbs. Use disposable plastic bags over the sink faucet for peeling vegetables to catch peeling scraps. Use two ¼ inch dowels set on each side of a batch of cookie dough as a rolling pin guide to roll out dough to the perfect thickness.